Today is Rob’s and my wedding anniversary so I took a few minutes to take photos of the garden. Margie’s garden will also be featured here. 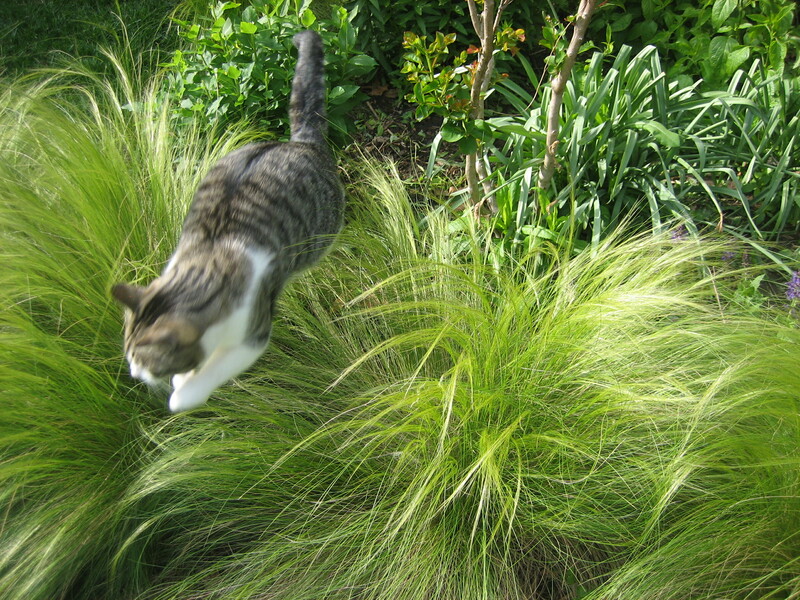 First I will show you a few photos of Margie’s garden. It is lovely. She has a real talent with designing flower pots. 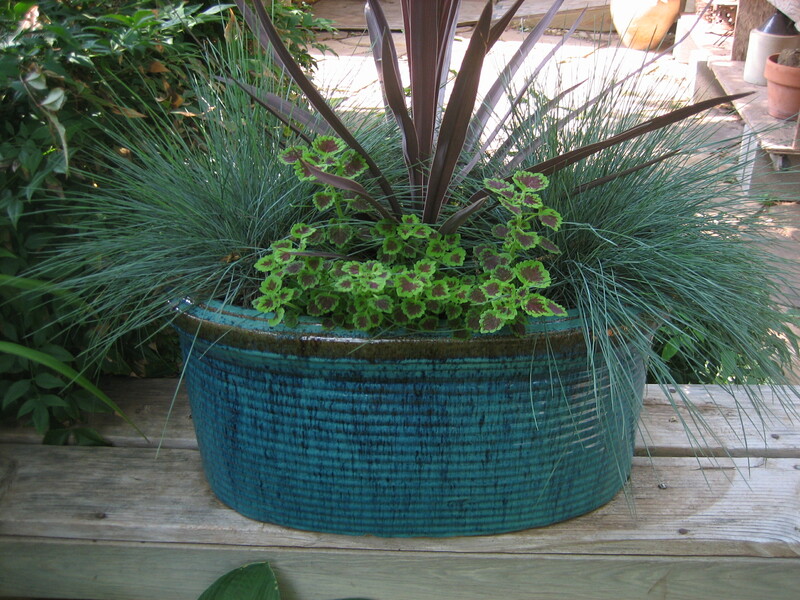 This is a spectacular pot with blue fescue, coleus and cordyline. Beautiful pot, not so good photo. 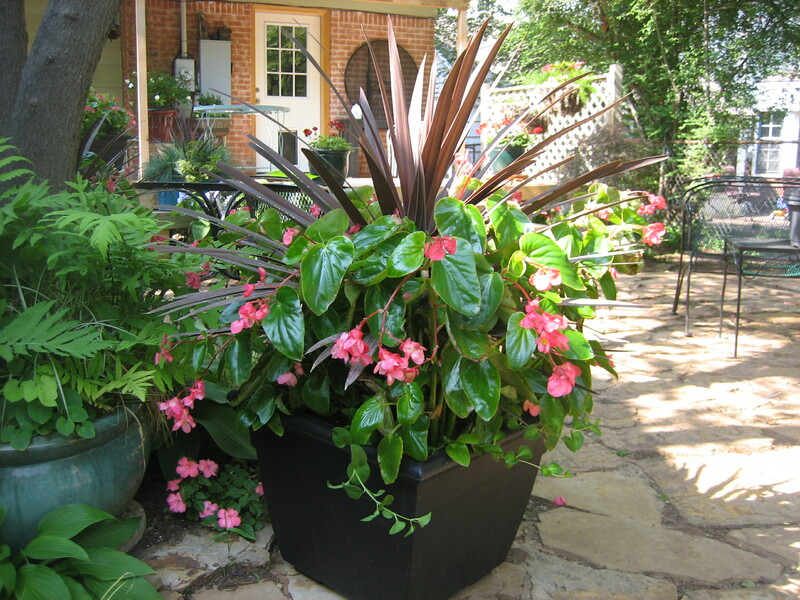 This is also a beautiful pot with cordyline (red spiked plant), angel wing begonias, and a little tail of vinca trailing out the front. Very showy! 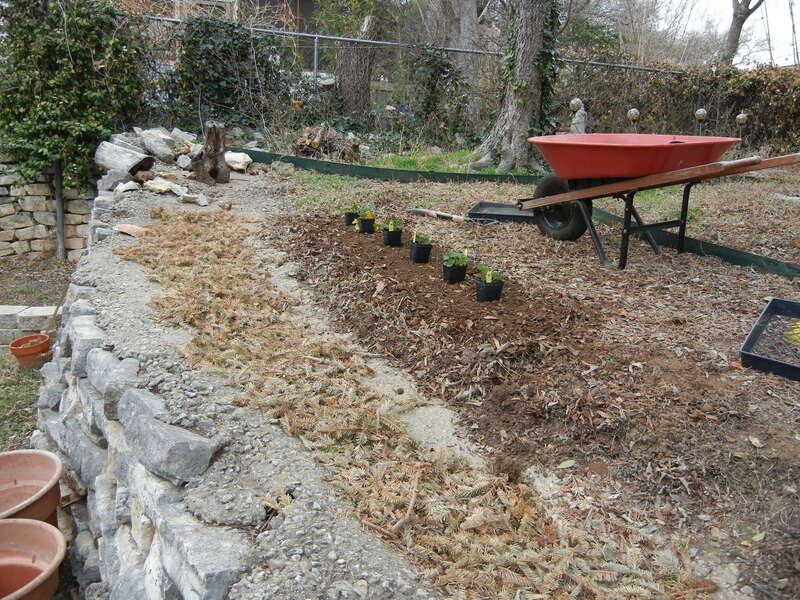 This photo of Margie’s garden shows a raised bed. 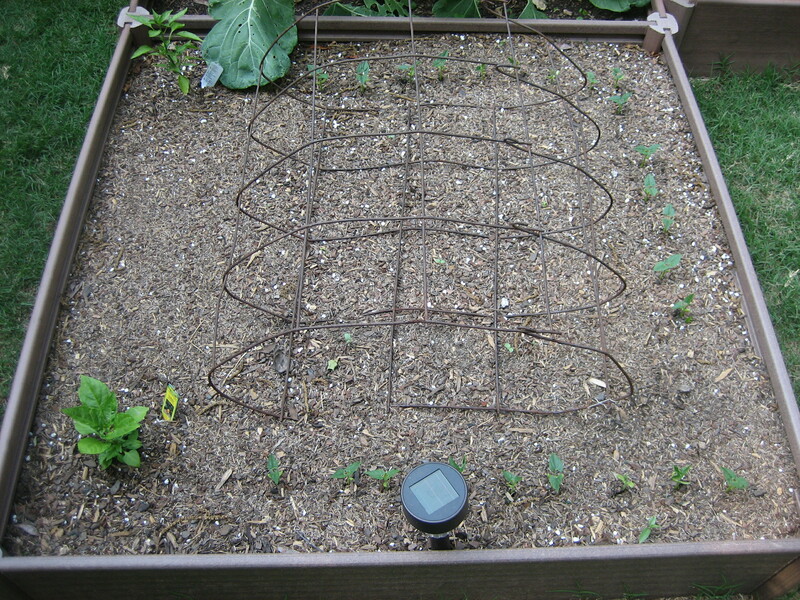 In the middle of the bed she has bent a tomato cage in half and planted zinnia seeds in each square. This is a great way to use a cage in a different way to support the zinnias when they get tall and tend to fall over with heavy flowers! 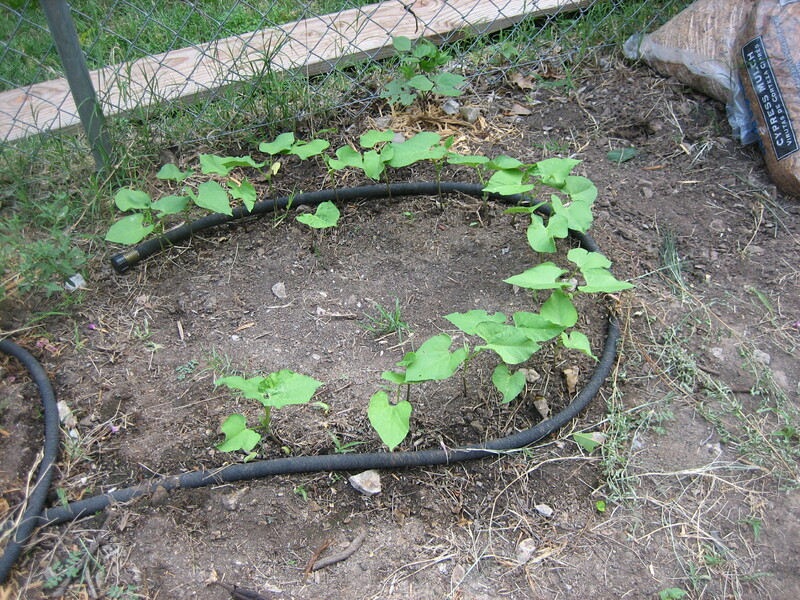 Around the sides of the bed Margie has planted green beans, and peppers are planted on the corners. Very neat. In a few weeks it will be full of flowers! This is a heuchera in Margie’s garden. 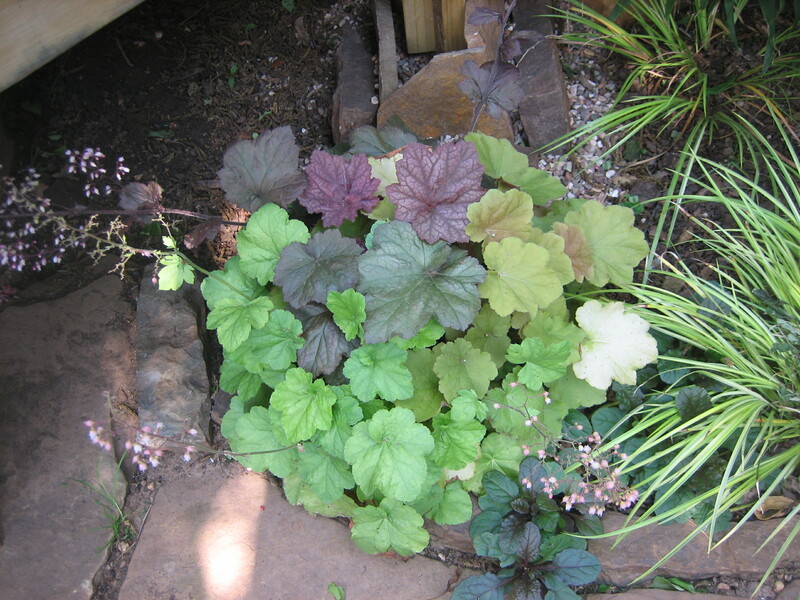 Actually it is a combo of 3 different kinds and colors of heuchera. Coral Bells is the common name for heuchera. I tried growing heuchera from seed this year and only managed to germinate one. I have it in my garden. Sorry friends. Maybe next year I will be more successful. It is a shade perennial and Margie has is in the perfect spot. 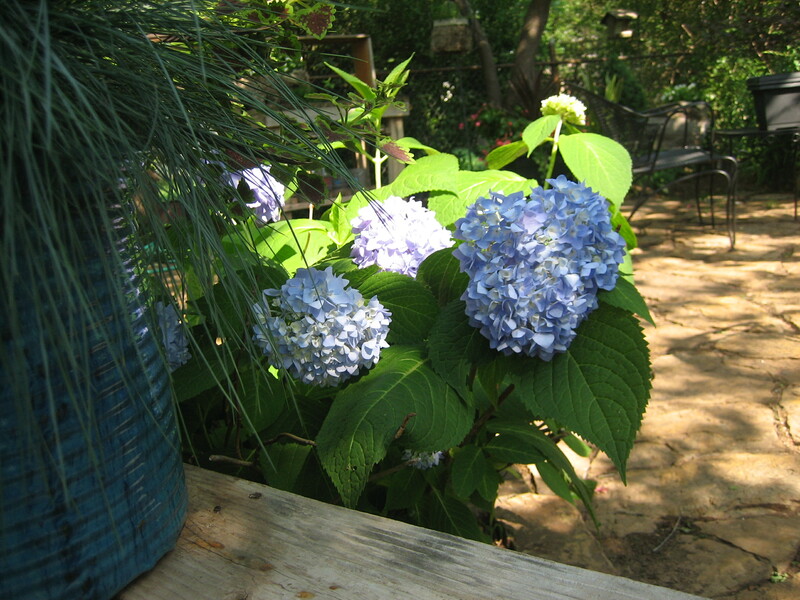 Also good for cutting, these Hydrangea in Margie’s garden are stunningly blue. Now I will show pictures of my garden. 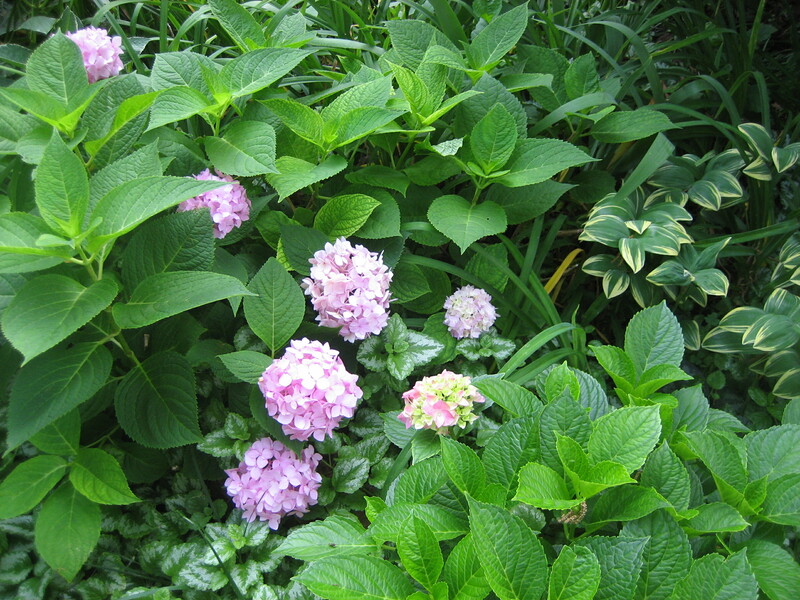 These are my pink Hydrangea which are also nice in a bouquet. They may not get enough sun, but they are beautiful. 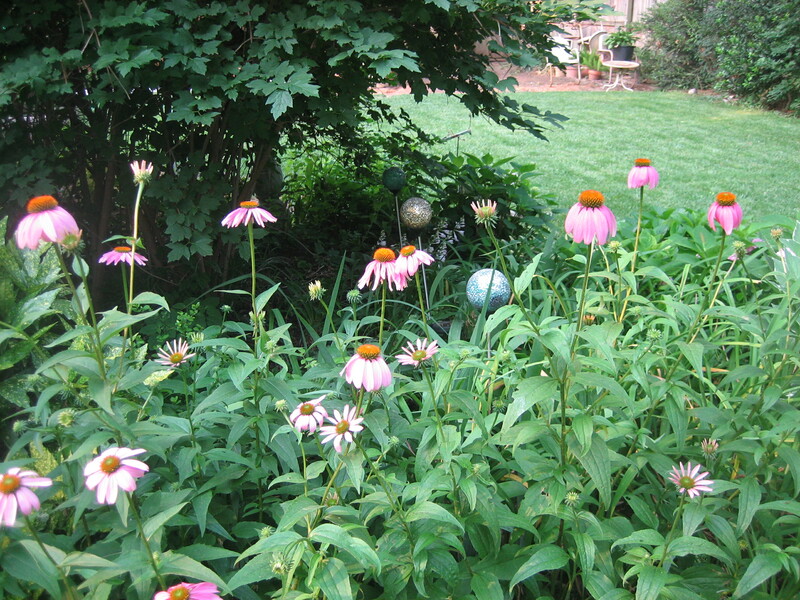 The purple cone flowers have never been more beautiful. 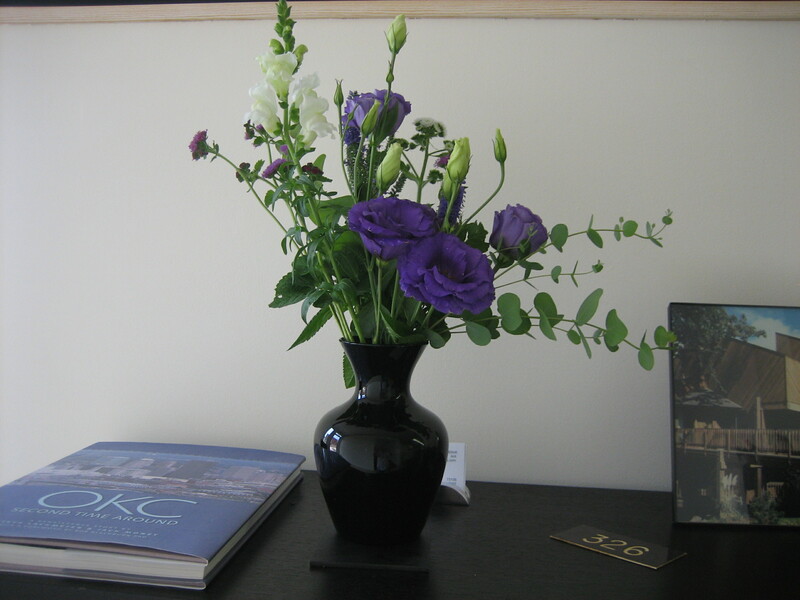 They also look good in a vase. 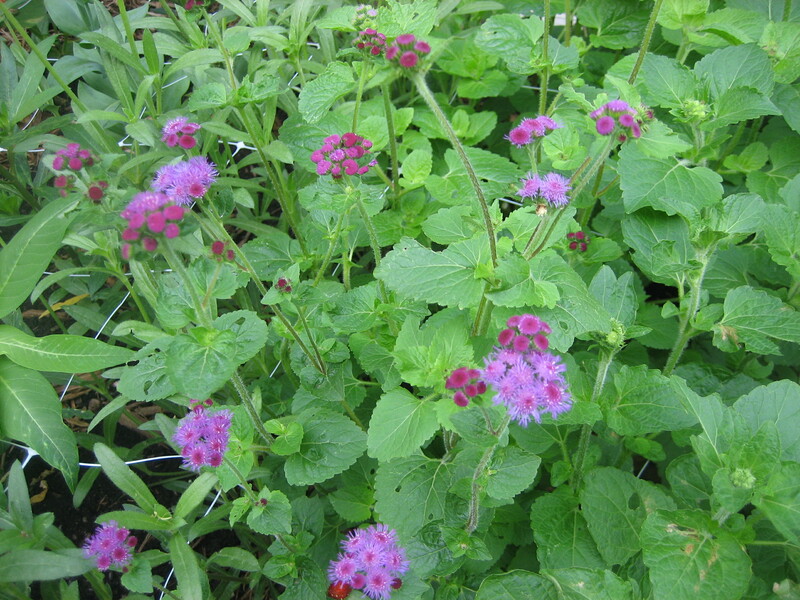 This is the tall red ageratum used in bouquets. It is really purple like the photo. 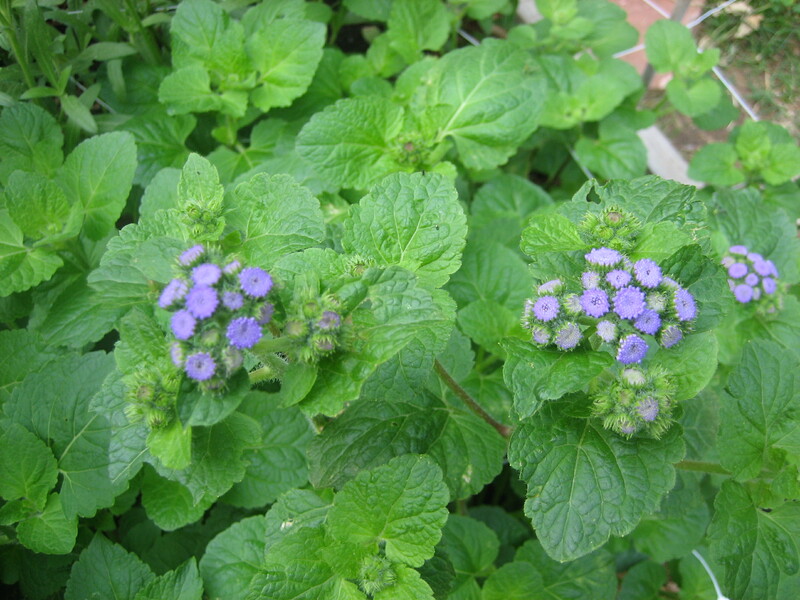 Tall Blue Ageratum also for cutting. Purple gomphrena good in a vase and also good as a dried flower. 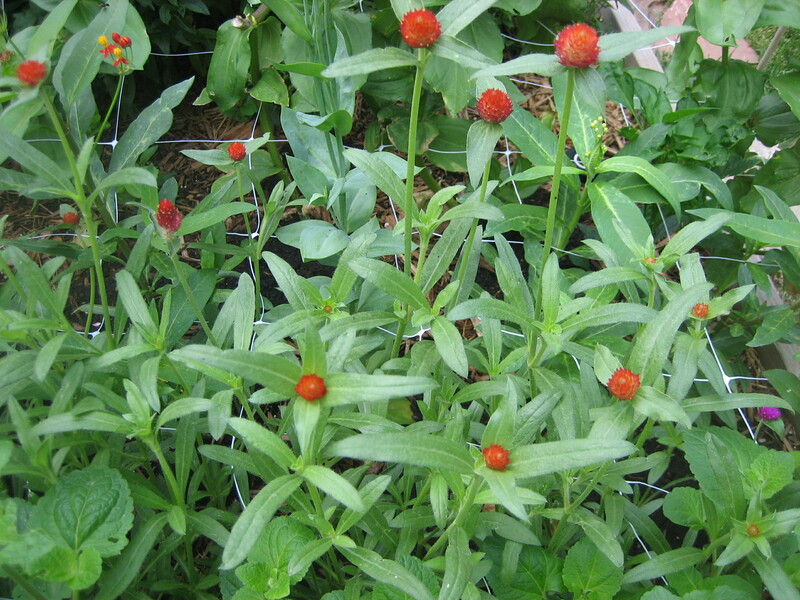 Strawberry Fields Gomphrena – the best gomphrena for fresh and dried bouquets. 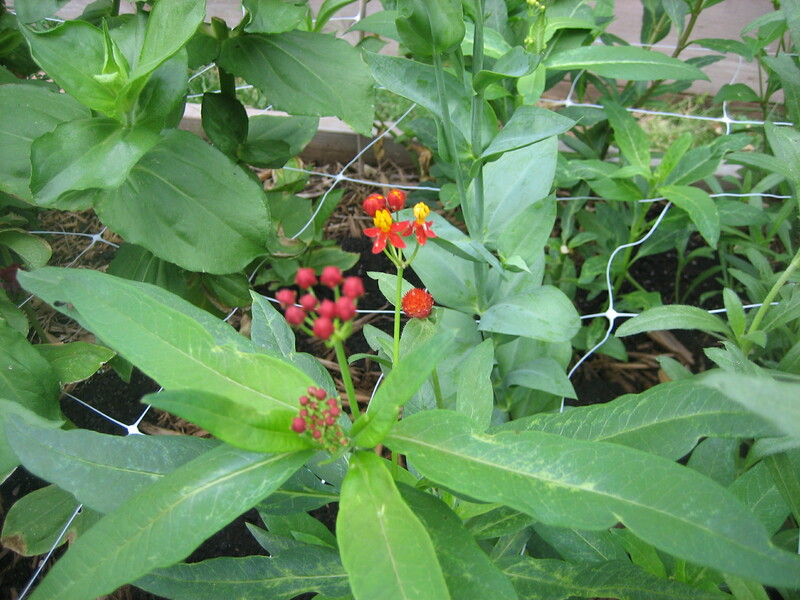 Butterfly Weed… This is a milkweed and the Monarch butterflies love this so I did grow it for them. 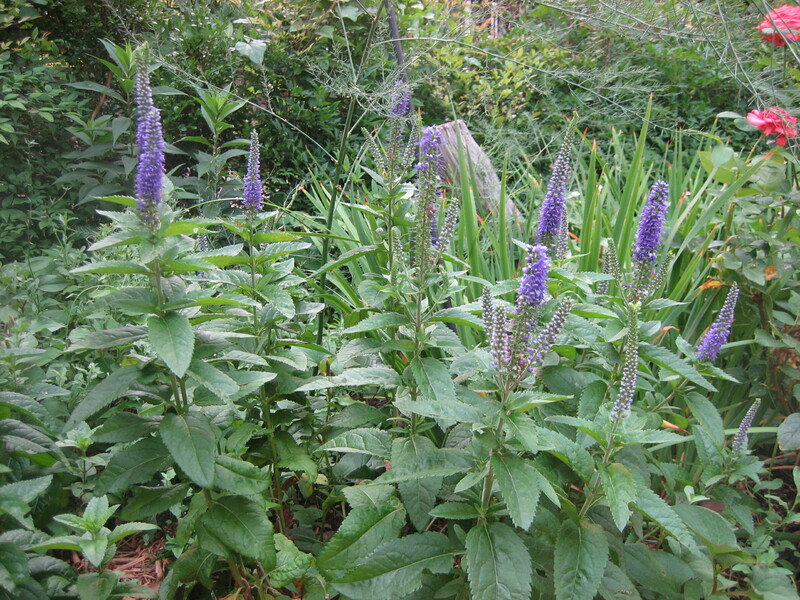 It is tall and very sweet in a bouquet, but not showy. Zinnias with snapdragons in the back. 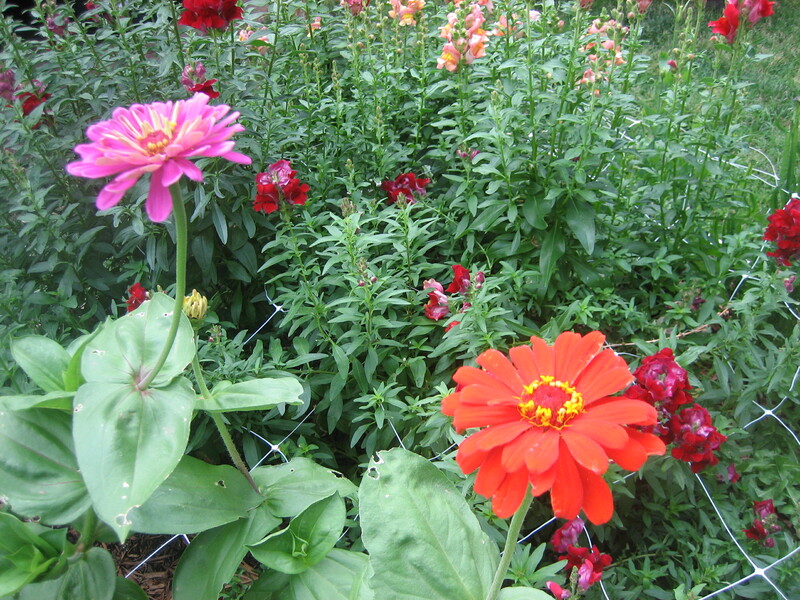 I just direct seeded more zinnias in the front yard and in the back yard behind the garage. This is Veronica “Sunny Border Blue”. It is wonderful in bouquets, and it comes back every year in my yard! 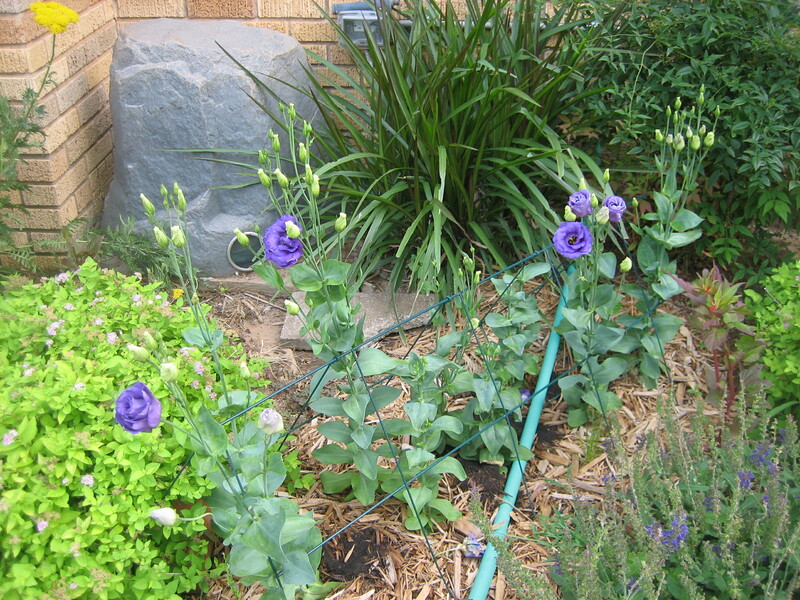 These two photos are the blue lisianthus in the front yard. I have to cut them every day! Yay! This is a bush I got at the OKC OSU farmers’ market 2 years ago. I haven’t tried it in a bouquet yet, but it has beautiful orange flowers. 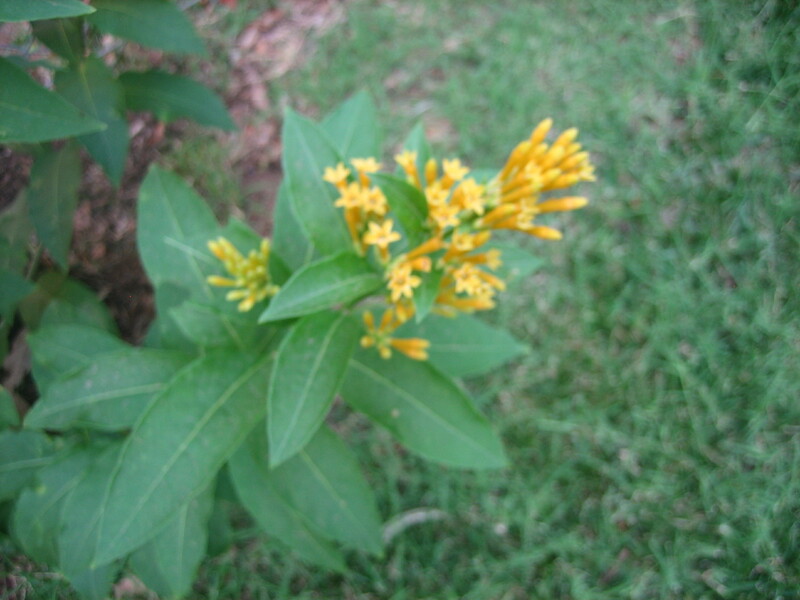 And Pat, I remembered the name – Cestrum! Here is my bouquet for today at the office. 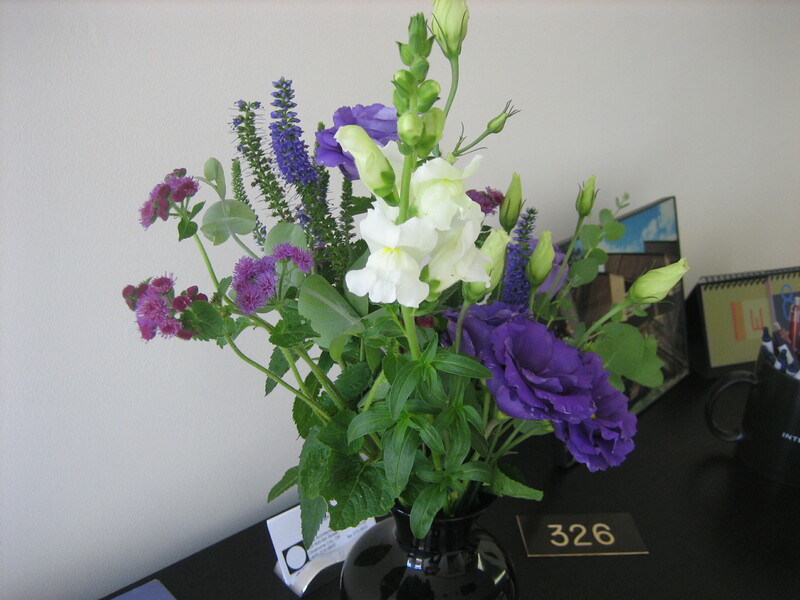 It is a purple and white bouquet with lisianthus, veronica, white and purple ageratum, eucalyptus, and white snapdragon. It is a pretty bouquet. 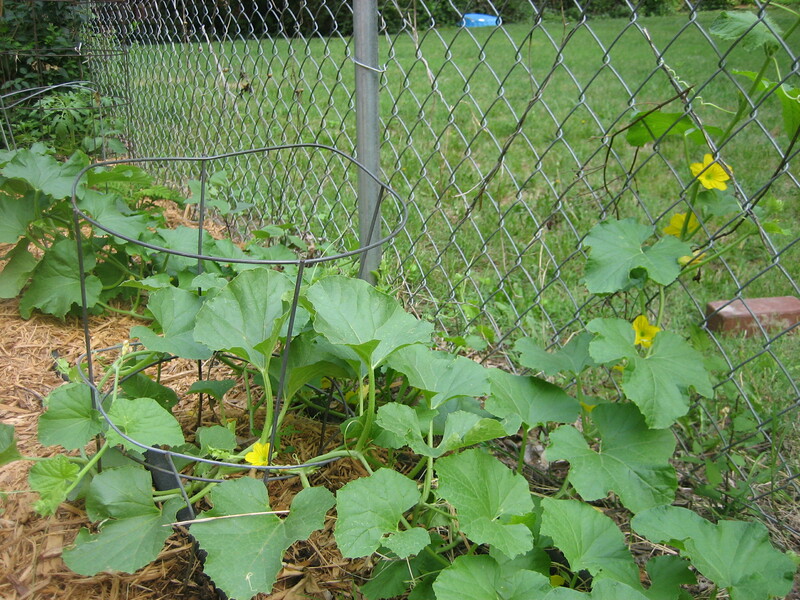 Now I will show some photos of my new veggie garden. 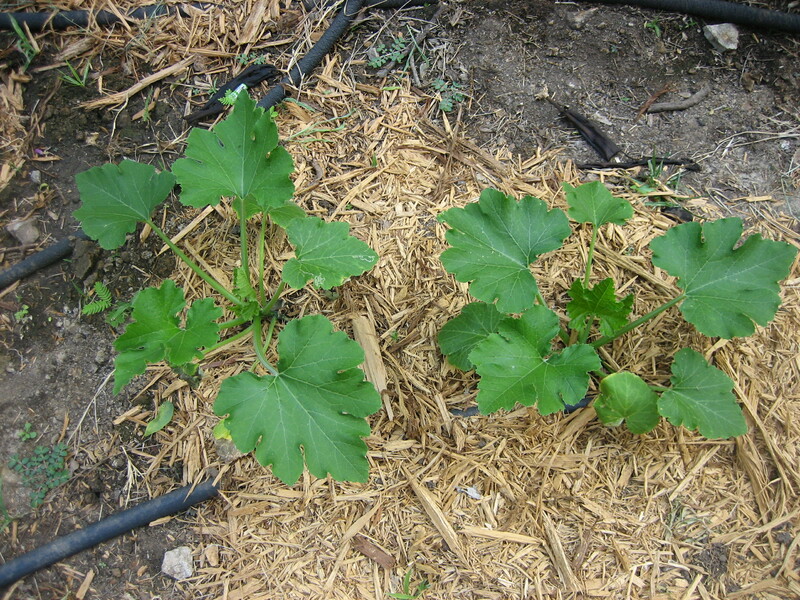 This is a photo of the Santa Claus Melon plant that Blair and Andria brought me in April. It loves heat, manure and water. 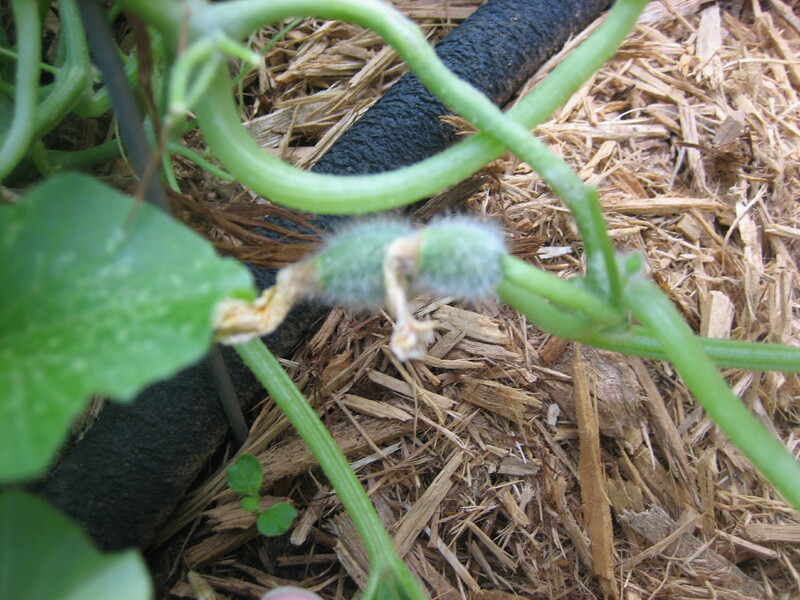 Two little melons on my Savory melon plant I bought while Andria and I were shopping at Whole Foods in Austin. Aren’t they cute? The final garden photo! Yay! These are green bean babies. Besides tomatoes, I think fresh green beans are my favorite. 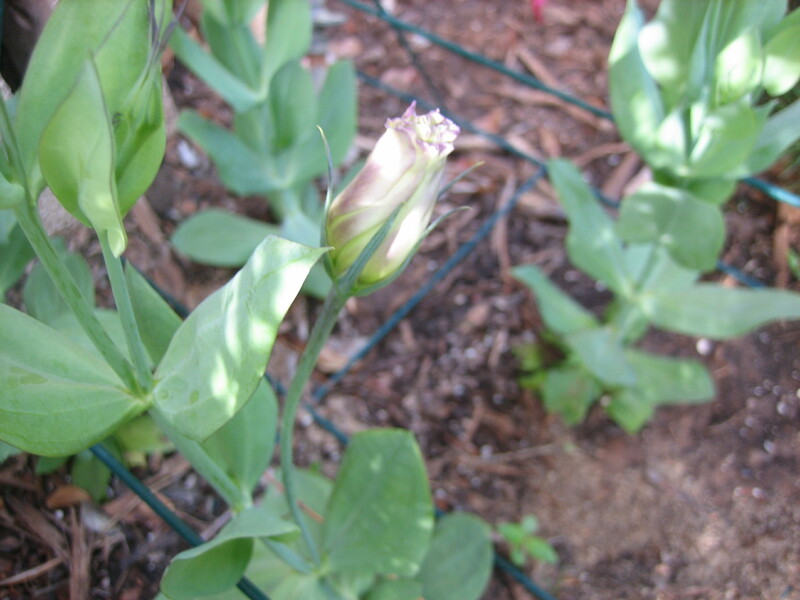 They are the easiest to grow and nothing seems to bother them besides a caterpillar or two. 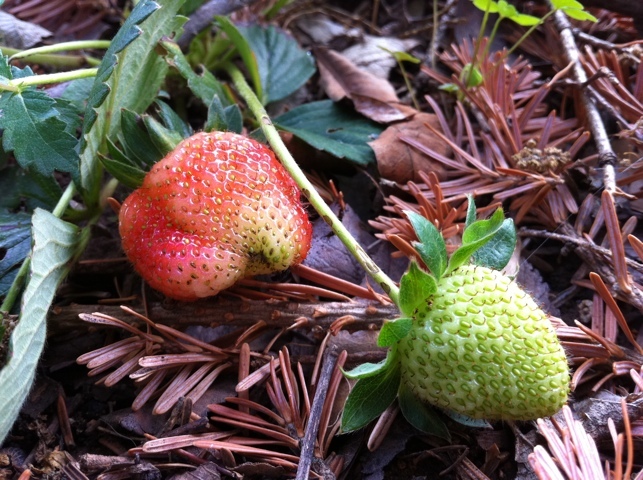 Unless you live out where Pat lives and then the deer may munch a little more than the caterpillar. 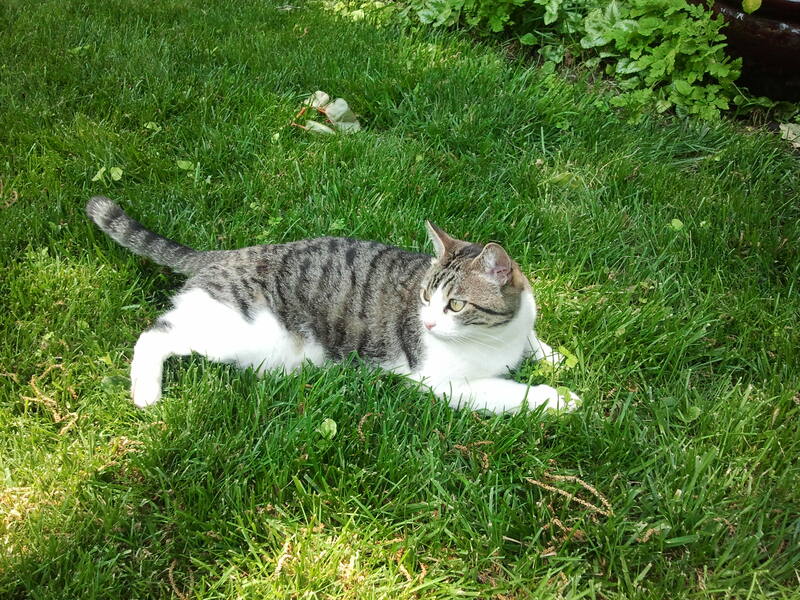 The last picture is Rosie in the cool grass. She really didn’t want her photo taken today. She had just had a long morning nap and was not in the mood. I think this was the 10th photo that I took. She finally cooperated somewhat. 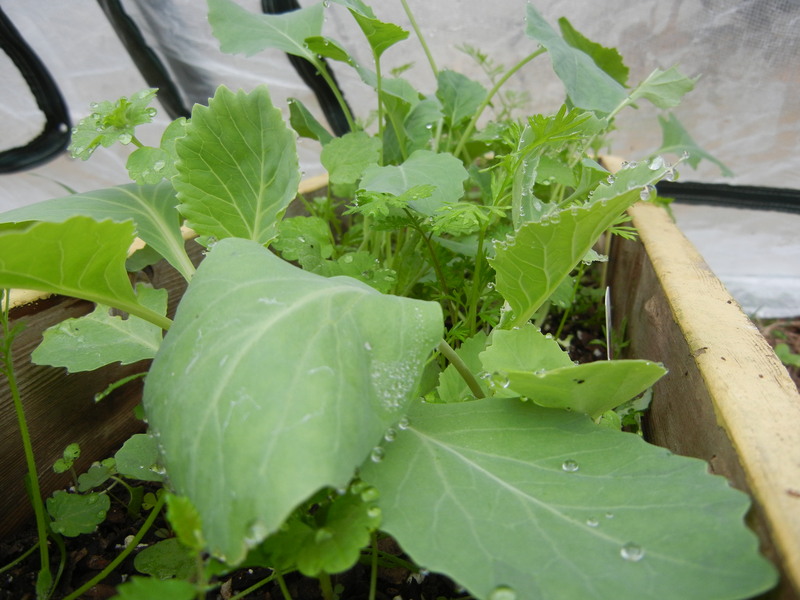 I took photos of the cutting flower garden yesterday (yesterday was really early May) and thought I would show you how the seedlings are coming along. Of course Rosie came along and got in the photos. 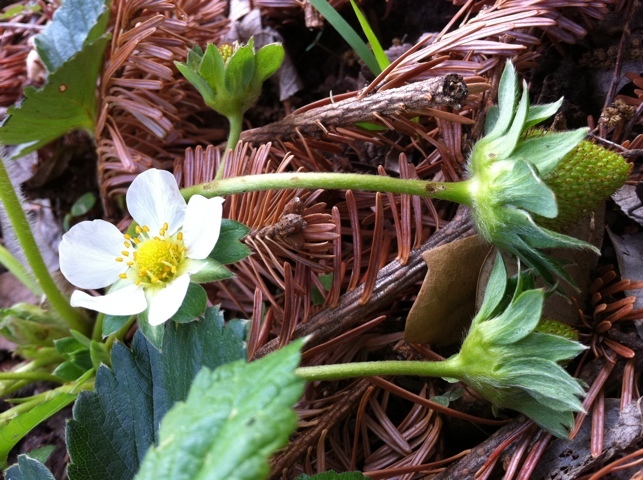 There were some surprises in the garden too. This was the first surprise. I found this snail and took a photo of it next to a pansy. I have never seen snails this big in OKC before. I hope it hitched a ride with Blair and Andria and got to OKC accidentally. I also hope it isn’t a sign of things to come. I threw it away in the big trash can. It will probably go to the dump and make lots of other big snails. No, I didn’t kill it. I needed Anne to help me do that, and she wasn’t gardening with me at the time. This isn’t actually a flower from a seed I planted. 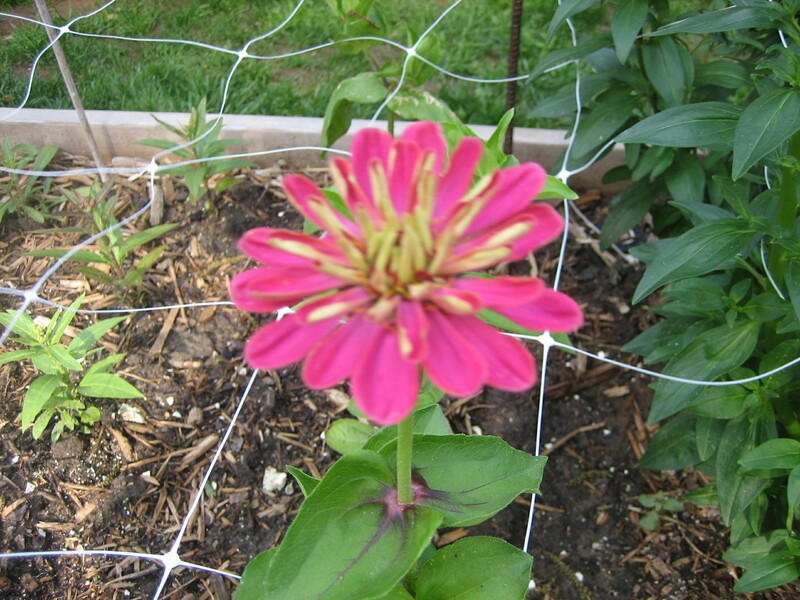 I bought a few zinnias at Doug and Anne’s plant sale about 3 weeks ago and planted it in my cut flower garden. They have all survived so far in this strange weather, and this is my first bloom. 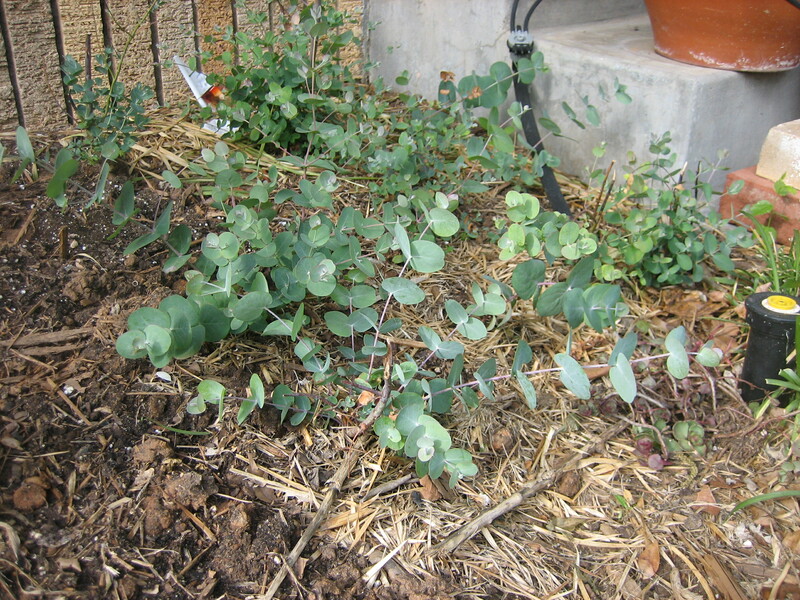 This eucalyptus is from seed that I planted last year and it wintered over in the front yard. It doesn’t winter over too well in the back yard. I have determined that the front yard is one or one half zone warmer than the rest of the yard. Eucalyptus make great filler in bouquets. Some are almost long enough to use. 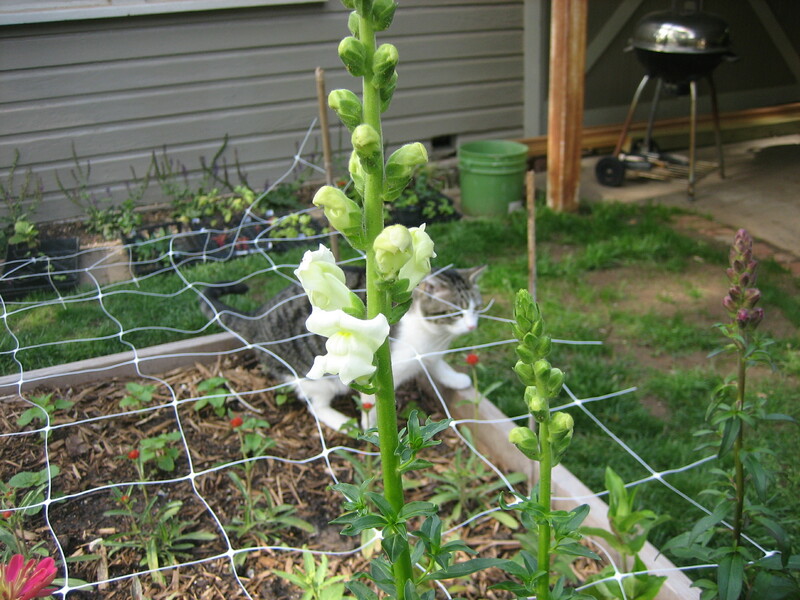 This is the first Snapdragon to bloom. 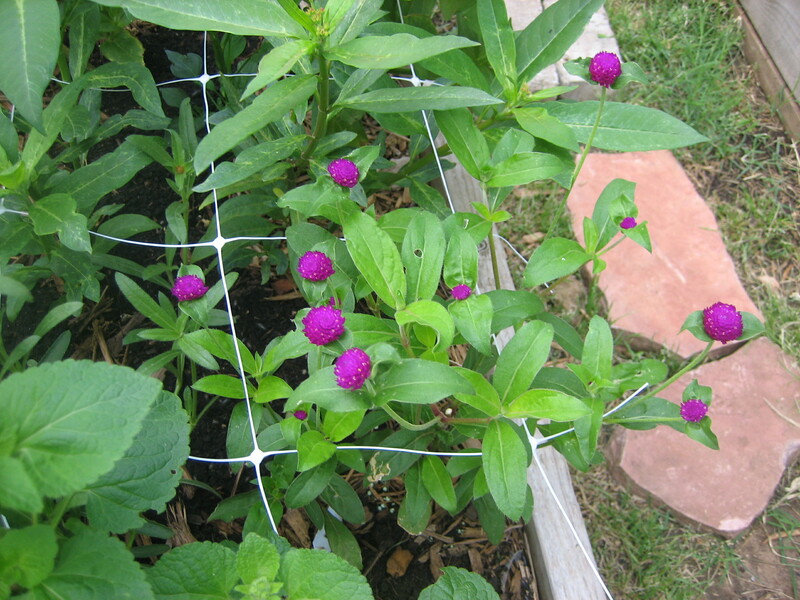 I have the entire cut flower bed covered with this very light weight netting that Anne and I used when we had a small cut flower farm. It keeps the flowers from falling over when their heads get too big. 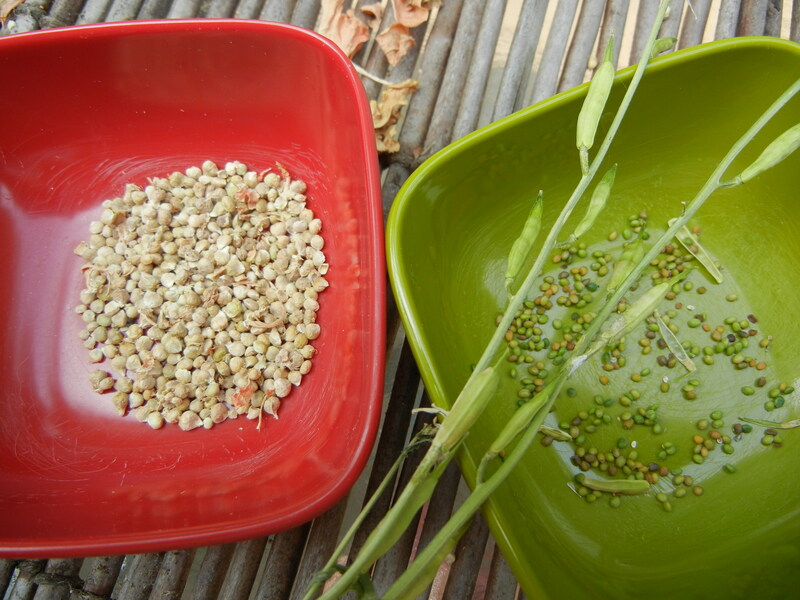 It is very useful in cut flower production. Rosie loves to walk under the netting and rub her nose and whiskers on it. Lisianthus are difficult to grow from seed so Doug always gets Anne, Pat and the rest of us a couple of flats of lisianthus seedlings and grows them in the greenhouse for us. They also need to be staked or netted. I planted these in the front yard so I really didn’t want to use netting. 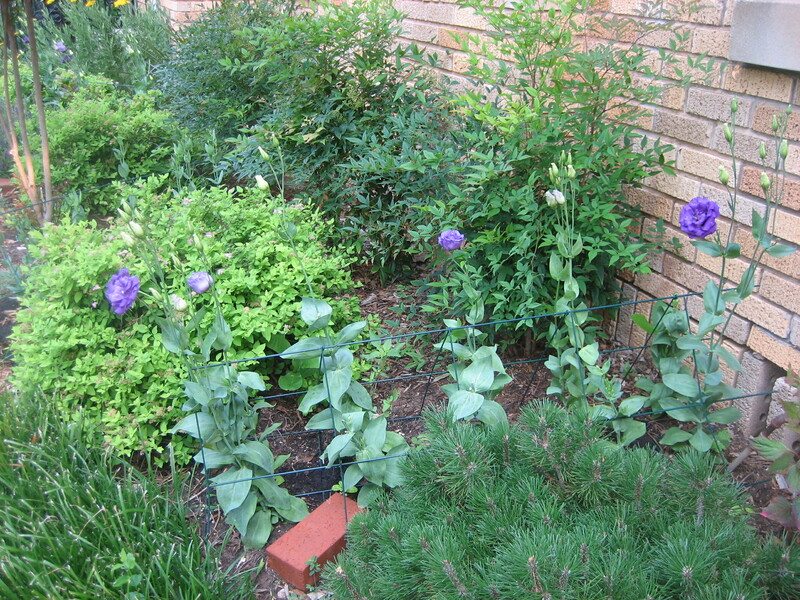 Anne suggested I try using these triangular green tomato cages turned sideways to stake the lisianthus. They don’t show from the street like white netting would. I hope they work. So far, perfect. 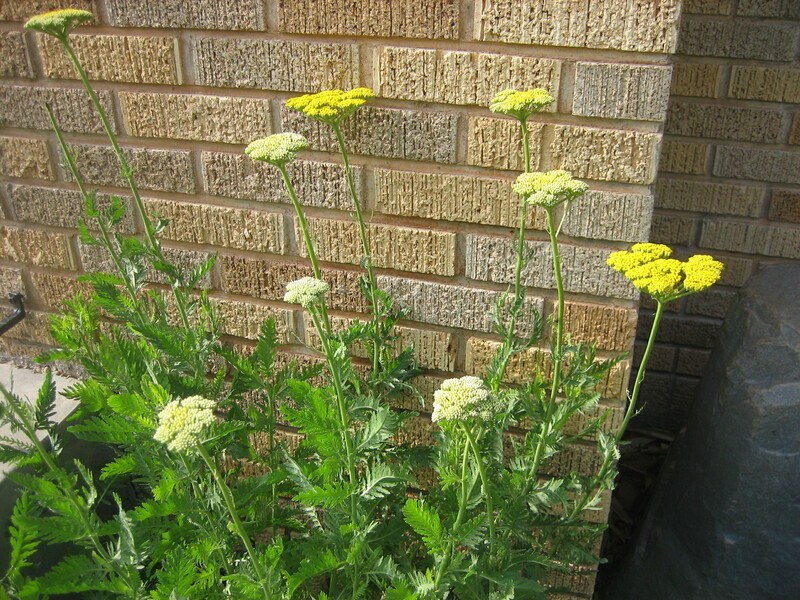 Yarrow are perennial and make great garden flowers. These would grow great in Texas too. This is neighbor’s cat. We are not sure where he lives, but he likes to hang around. We call him Blackie. 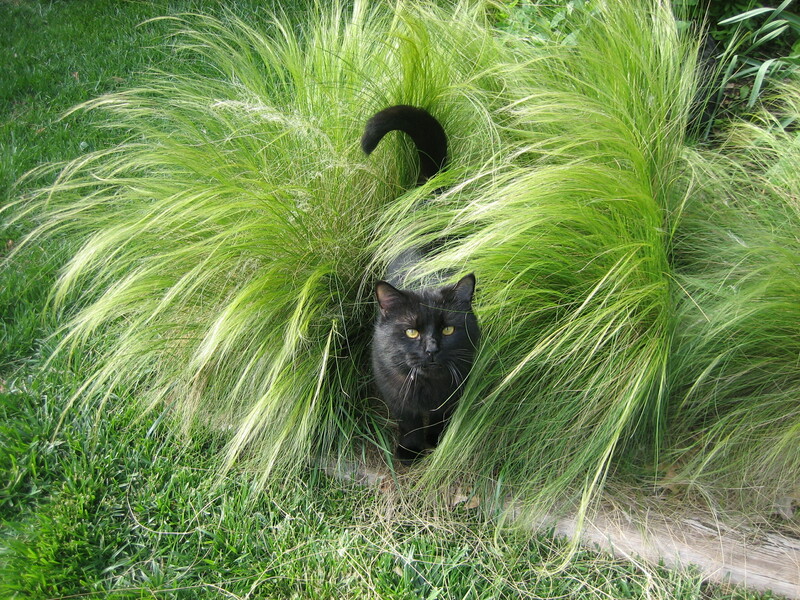 He likes to nest in the Mexican Feather Grass. Rosie is not always happy that he is around, sometimes she tolerates him, sometimes not so much. 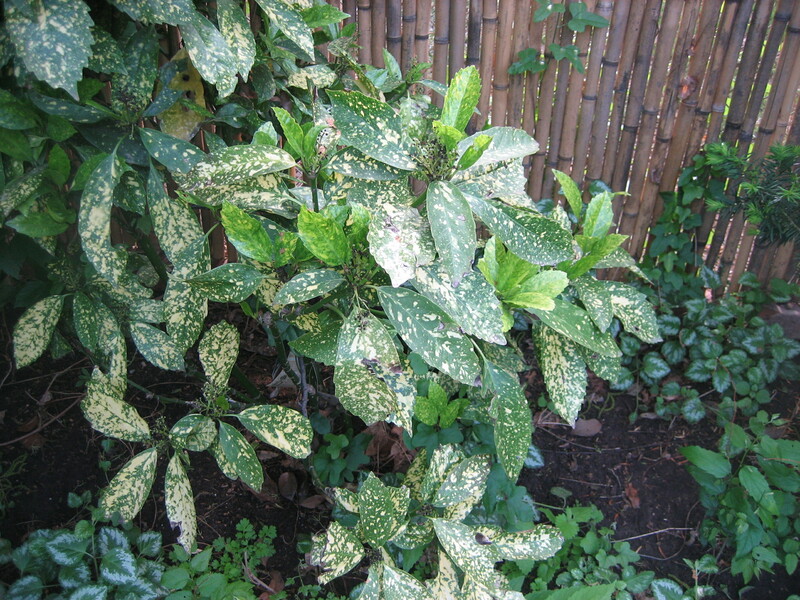 Acuba is a great evergreen shade bush. 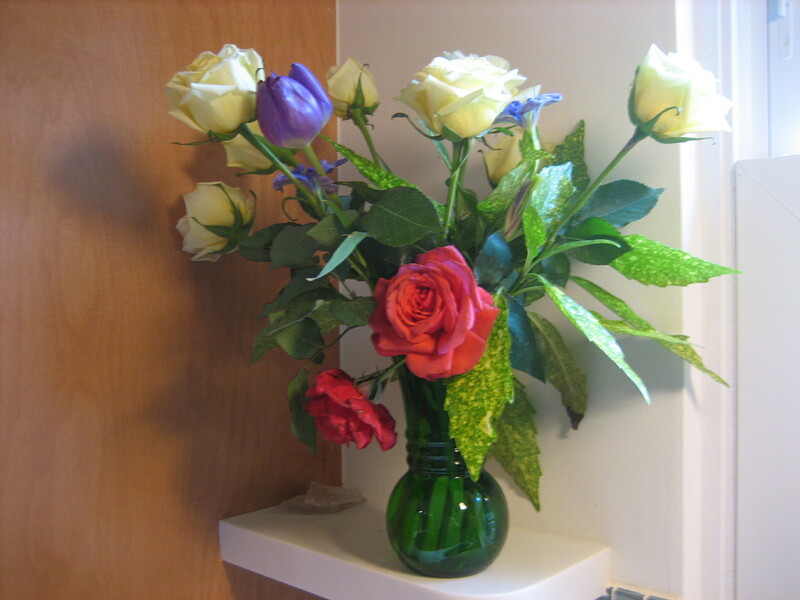 It is great to use in bouquets as a filler. Here is my first lisianthus bouquet with white roses from Walmart and my Pinkish Orange Roses from my garden. They are called Fragrant Cloud and they make the whole room smell delicious. After about 10 minutes of trying to come up with a catchy title for this blog post, I ended up with “Tomatoes!”. That’s the only one that captured my excitement well enough for just having picked and eaten our first tomatoes of the season within the last week. Oh how I’ve missed that taste! 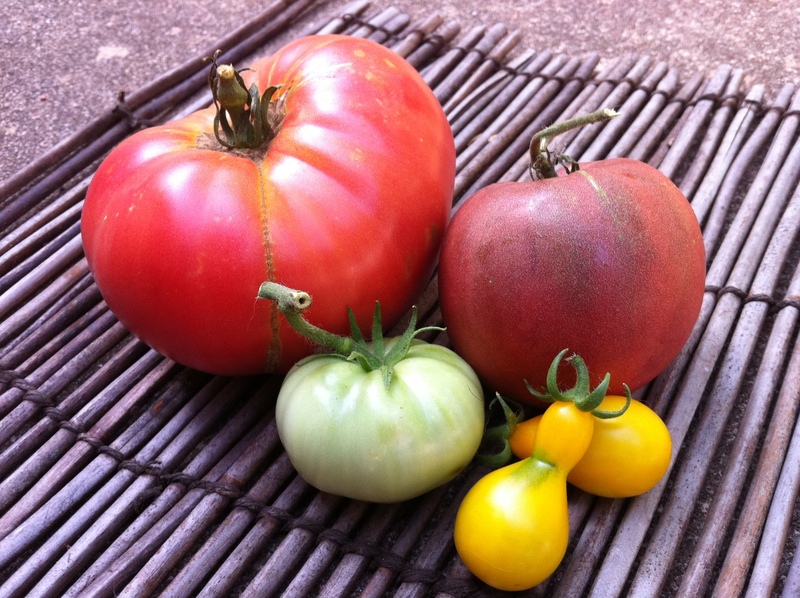 I am trying to write another post from my phone, outside here as a field correspondent for Blandria’s Backyard Garden, but it’s 102 degrees according to the thermometer, and I am sweating already, so we’ll make this quick with a few snapshots of the tomatoes. Pictured here: Brandywine (the largest), Cherokee Purple (the deep red one), Yellow Pear (the ones that are yellow and look like pears), and one mistake pulled off by accident. Butterball on his evening duty. Although spring has technically only been here for a little more than a month, I can tell that our pleasant days and cool nights are quickly fading. Our cool weather greens can tell too. We’ve had what might end up being the hottest April on record in Austin, although it appears that May is going to start off rather cool (and we might actually get rain too!). 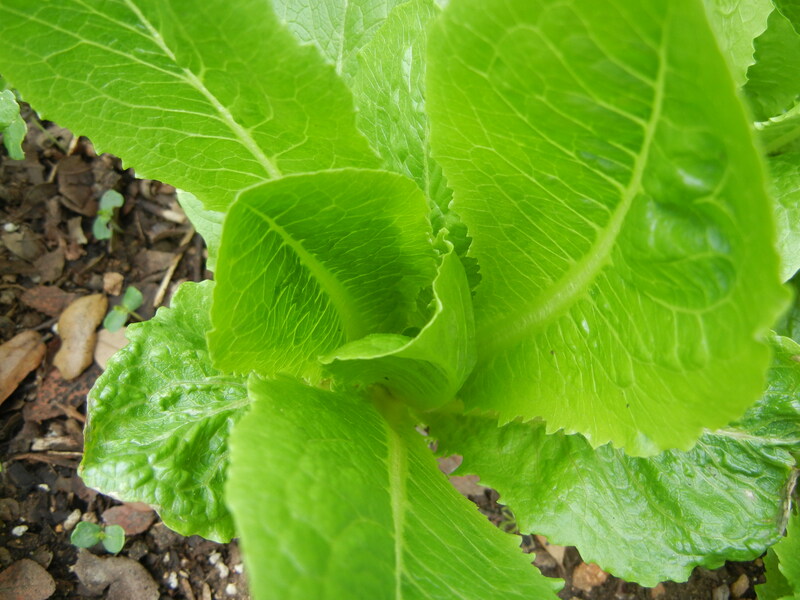 Still, it’s too late to save our lettuce, spinach, and arugula, all of which have flowered and/or gone to seed. We decided we’d try to save some of these seeds, so we spent the afternoon clipping arugula pods and pulling off spinach seeds. 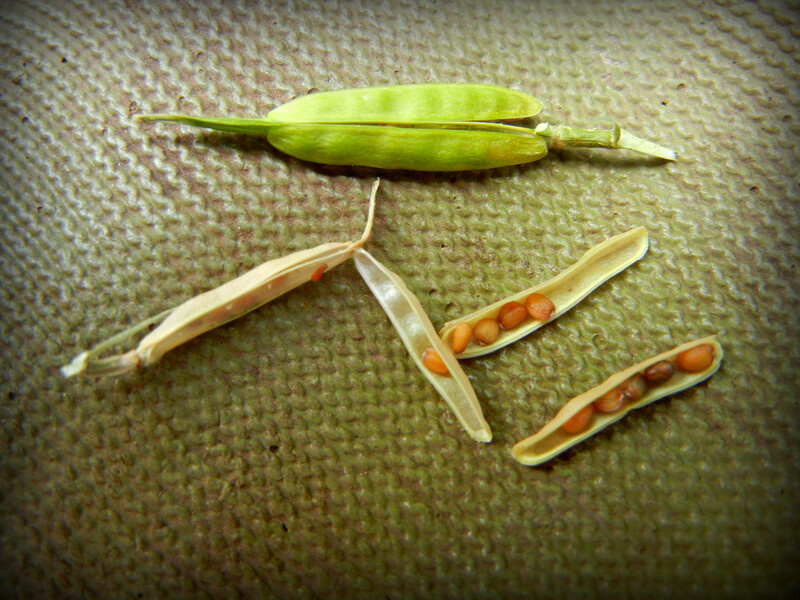 I have to admit we don’t really know what we’re doing, so it’s possible that these seeds won’t actually sprout this fall, but we’ll see. Spinach seeds on the stem. 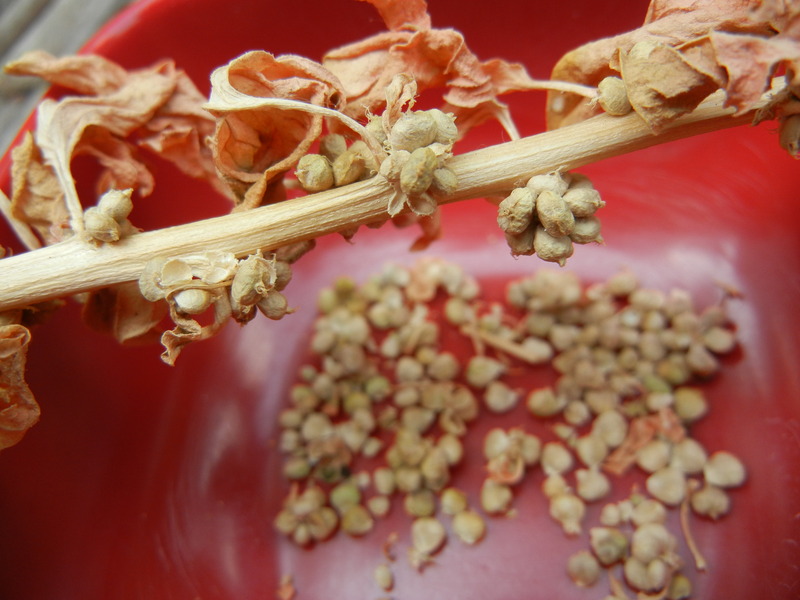 Google tells me these are female seeds. Spinach on the left, arugula on the right. 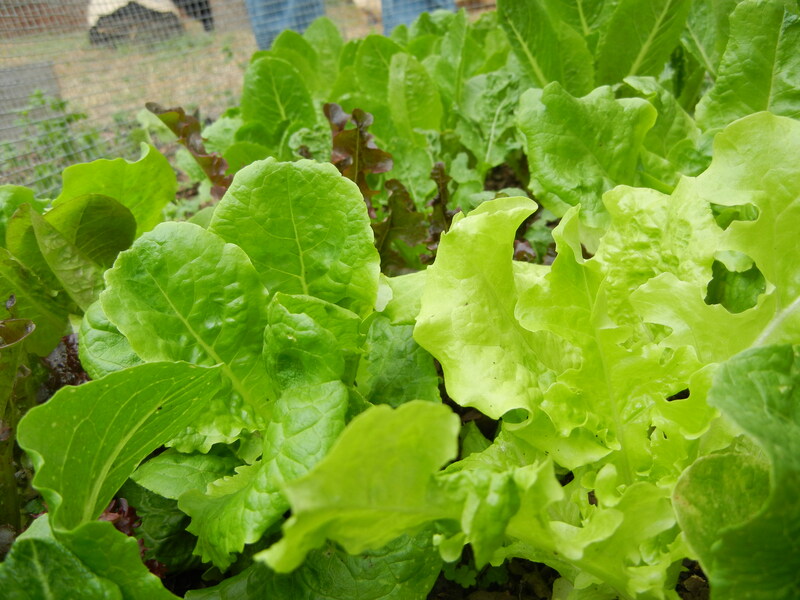 Earth Week is a good time to reflect on all that Mother Nature gives us, and, as small-time backyard gardeners, we’re thankful for the few things we can grow each season. Learning how to take care of plants, watching things grow and flourish, and sharing time together outside are all things I’m thankful for. Plus, spending time outside means less time sitting around watching TV, although I’m still a sucker for some 30 Rock and Friday Night Lights. This week at work, our “Green Team” brought in a speaker named Matthew Moore who started a project called the Digital Farm Collective. 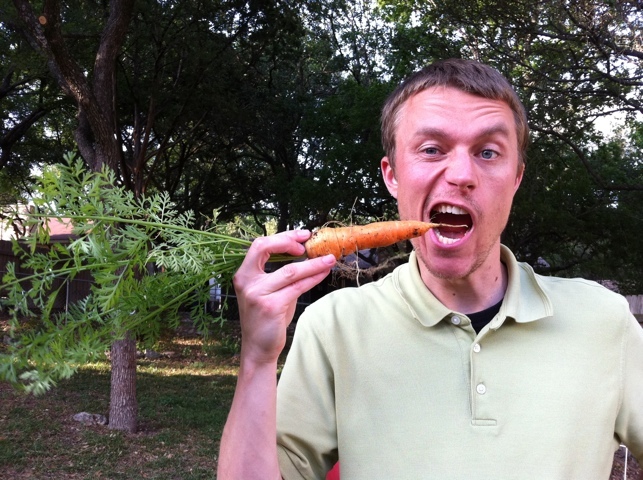 Matt is a fourth generation farmer in Arizona who also loves art. He’s working on an online archive to compile footage of every cultivated plant in the world. Pretty awesome, right? Using art to inspire social change, he asks farmers to pass on their knowledge through time-lapse photography of a plant from seed to harvest. His videos were featured at Sundance in 2010 and in the produce departments of some grocery stores. Here’s one of the “lifecycles” videos he shared with us. There are plenty more on his blog. Matt asks people if they would change their eating behaviors if they knew one head of broccoli took 105 days to harvest or squash took 55 days. Would we waste less or appreciate farmers more or understand better where our food comes from? I think so. Matt also left some seed packets for everyone to take home. 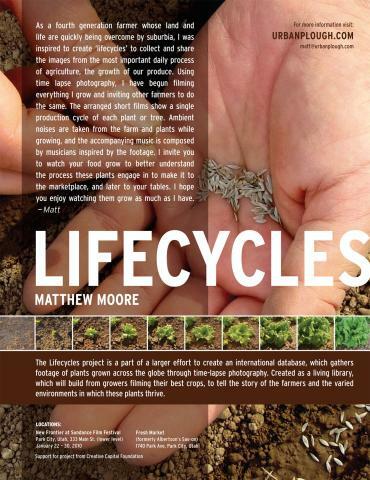 These are probably the coolest seed packets I’ve seen with photography of the plant through it’s lifecycle. I took a squash packet, so I’m looking forward to getting the seeds planted soon. 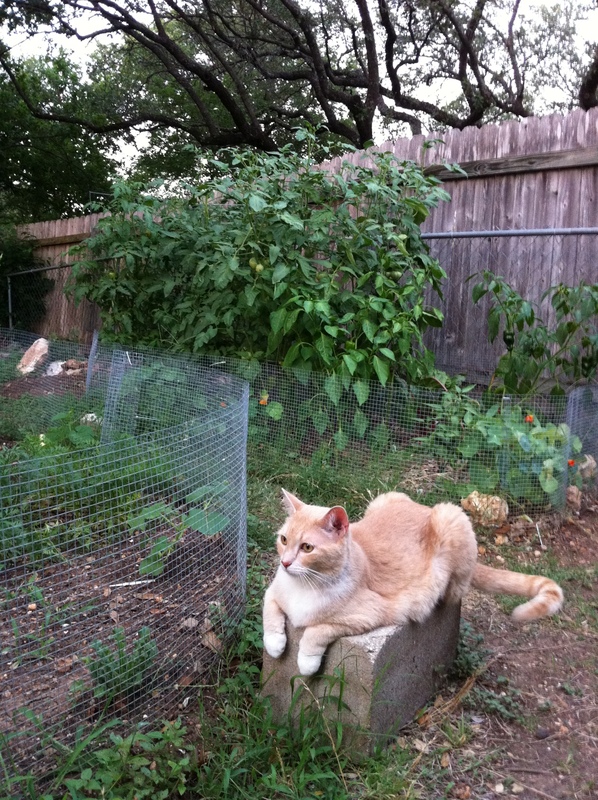 The spring garden is in full swing, and we’re loving this beautiful Austin weather right now. The cats have to be picked up and escorted into the house at night because they are too stubborn to come in. I don’t blame them. I’m trying to blog from the WordPress app on my phone for the first time, so I’ll make this post short with some pictures! 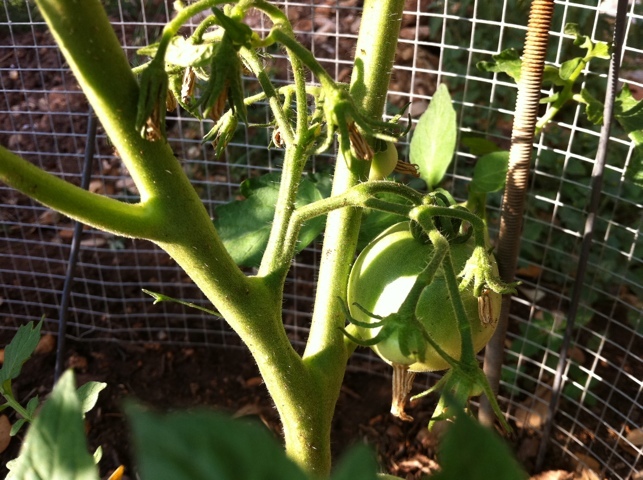 We also noticed our first tomatoes on the vine this week!! 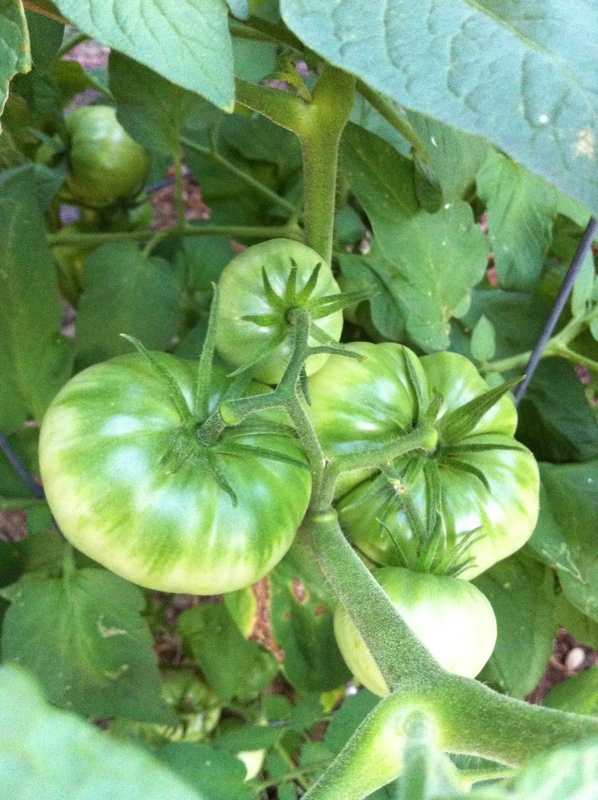 These are Cherokee Purple tomatoes, which are delicious heirlooms if you haven’t tried them before. 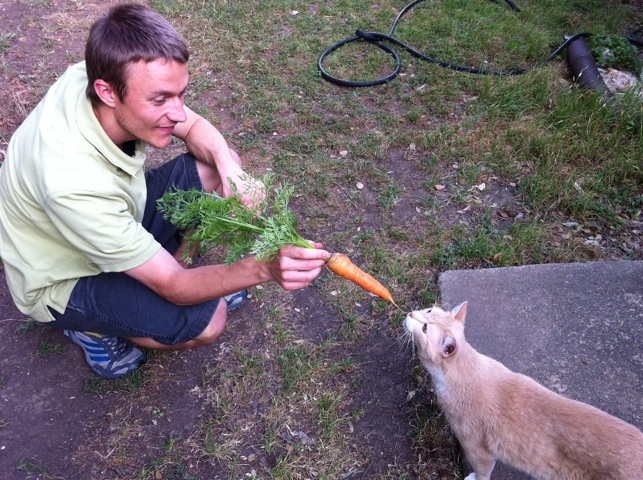 And Blair finally pulled up the first carrot that he’d been eying for weeks. More updates and pictures to come! 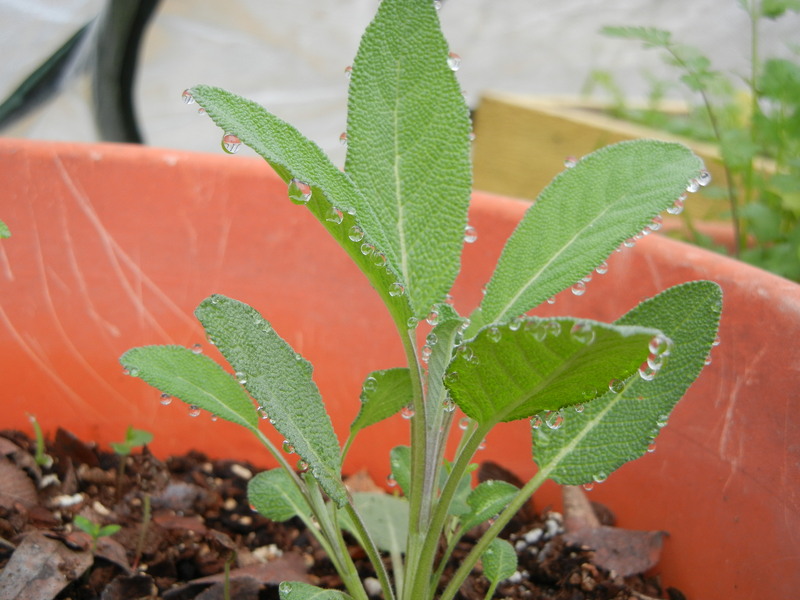 An early start in the garden today means catching fresh dew on your plants…that will soon disappear. Blair is outside getting ready to transplant several things we grew this winter in the greenhouse. 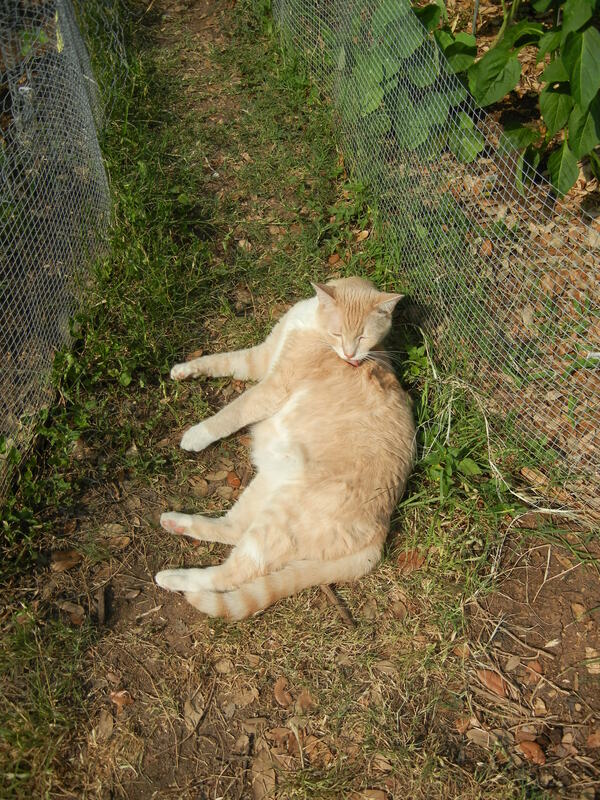 He already managed to get strawberries in the ground one morning before work this week (and before I had even gotten out of bed). He has the spring gardening itch. We got a book for Christmas called Edible Landscaping from Blair’s grandpa, and it’s gotten us to think about new places in the backyard to landscape with edible plants. 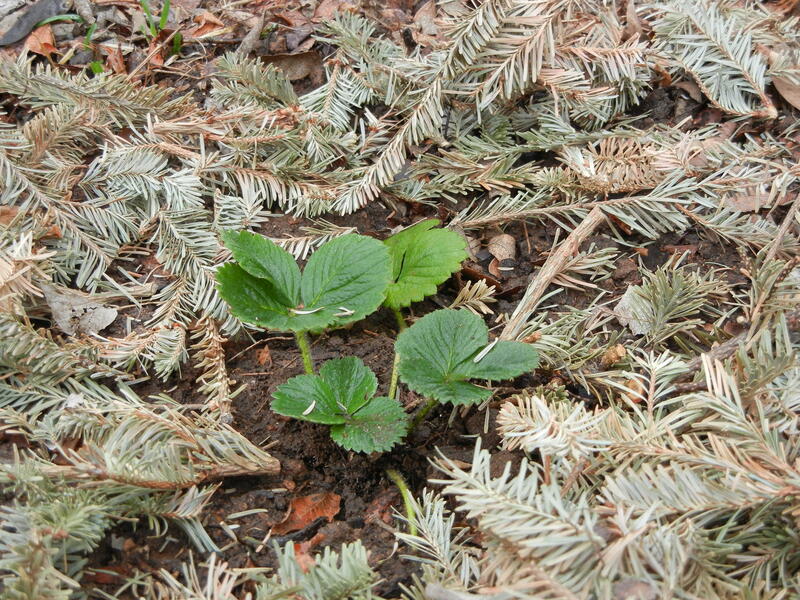 We choose a rock ledge to plant the strawberries above, in hopes they’d trail down the side of the ledge one day. 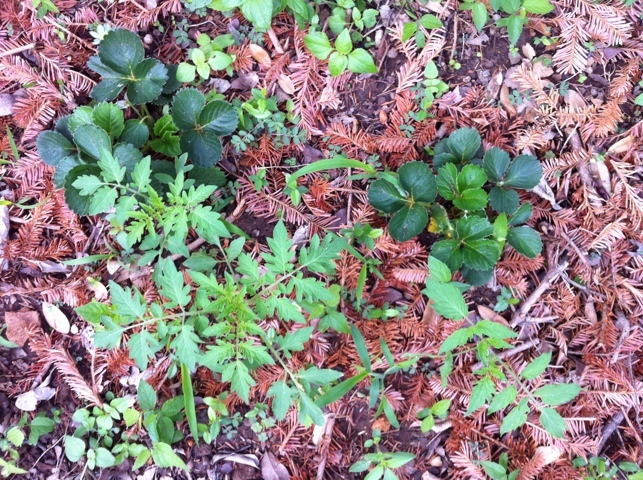 We saved the pine needles from our Christmas tree to use as mulch over the strawberries. 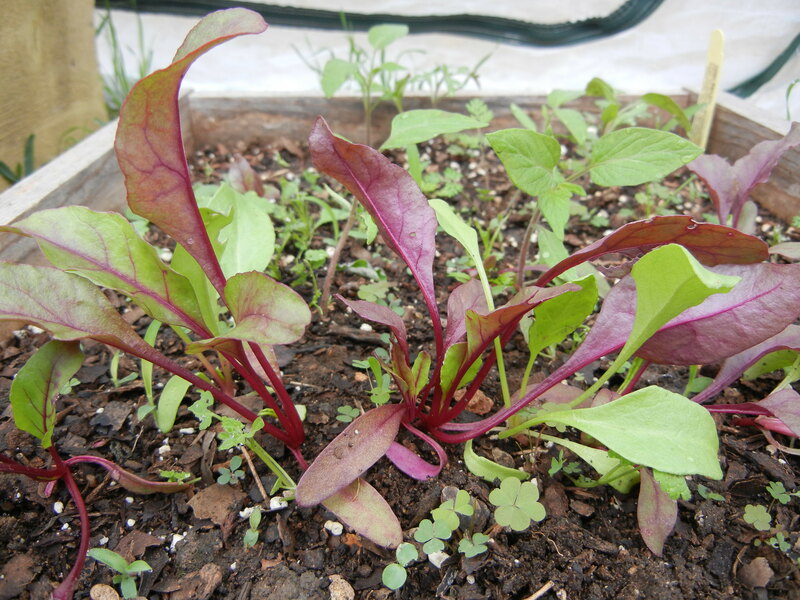 The winter greens we planted this fall are still going strong (because we caged them off from cats with chicken wire and covered them diligently through the frosts).